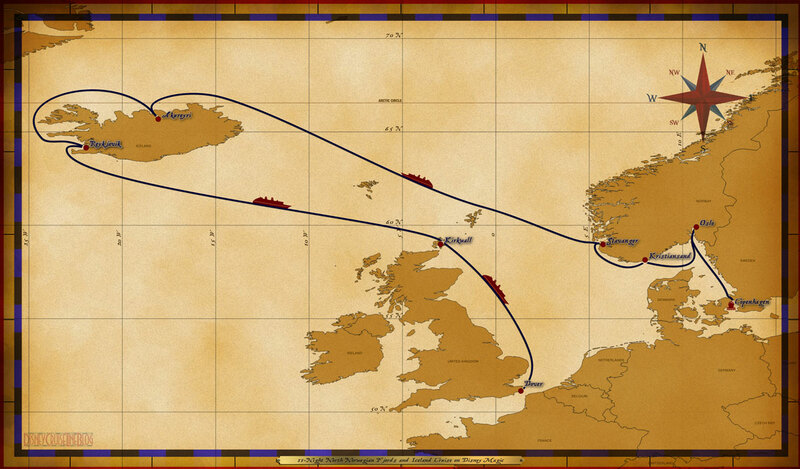 Disney Cruise Line is modifying their 11-Night Copenhagen to England repositioning cruise embarking on June 29, 2015 aboard the Disney Magic to include a call on Kirkwall, Scotland rather than Torshavn, Faroe Islands. There was no reason provided in the email as to why the Disney Magic will no longer visit the Faroe Islands. I have my suspicions as to the reason, but DCL would not elaborate when asked why the decision was made to change the port of call. However, the email sent to travel agents did express DCL’s excitement that they will be able to provide guests with a premier family experience and the opportunity to visit both of the countries that recently inspired the blockbuster hit, Frozen and Disney•Pixar’s Brave. The itinerary will remain the same with day 10 changing from Torshavn, Foroe Islands to Kirkwall, Scotland. Copenhagen, Denmark • Oslo, Norway • Kristiansand, Norway • Stavanger, Norway • At Sea • Akureyri, Iceland • Reykjavik, Iceland • Reykjavik, Iceland • At Sea • Kirkwall, Scotland • At Sea Below is a copy of the letter sent to travel agents who had clients on the sailing. Thank you for selecting a Disney Cruise Line vacation for your clients. We’re glad that they are sailing with us in the summer of 2015. In order to provide them with a premier family experience, we have modified our 11-night Copenhagen to England repositioning cruise to include a call on Kirkwall, Scotland, instead of the call on Torshavn, Faroe Islands. We’re excited to provide our Guests with this revised sailing itinerary that offers the opportunity to visit both of the countries that inspired the recent blockbuster hit, Frozen from Disney Animation Studios and Brave from Pixar Animation Studios. Your assistance in passing this information along to your client is appreciated. Kirkwall, located off the Northern coast of Scotland in the Orkney Islands, offers many fascinating historic attractions, adventure tours, and bountiful wildlife. We are confident that this revised itinerary featuring a call on the popular port of Kirkwall will allow for an exception Guest experience. Our Port Adventures team is currently planning a vast range of excursions ashore that we are certain everyone will enjoy. Your client can visit My Cruise Plans at www.disneycruise.com early next year for a full listing of available excursion options. 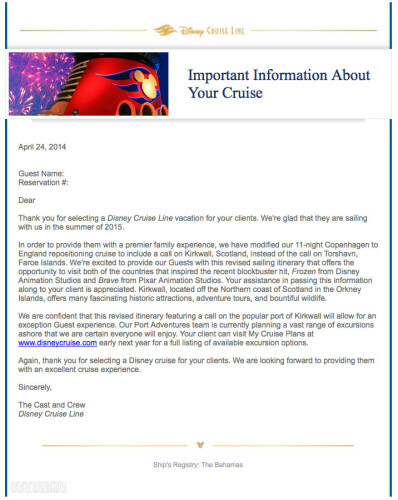 Again, thank you for selecting a Disney cruise for your clients. We are looking forward to providing them with an excellent cruise experience. This entry was posted in Itineraries, News and tagged 2015, Disney Magic, Faroe Islands, Kirkwall, Scotland by Scott Sanders. Bookmark the permalink. Glad I didn’t pick this cruise. I would have been disappointed. Scotland is much more accessible, either through other cruise lines or through land tours. Faroe Islands are a bit more unique, sort of a bummer to lose that. Apparently you support the needless slaughter of beautiful whales. The Faroe Islands are notorious for slaughtering whales every year in July. Anyone who is upset about not going there supports the needless suffering and slaughter of beautiful, intelligent, and feeing animals. :)) Good, another armchair critic wo knows nothing about Faroes but feels the need to criticise them. I didn’t know that if I travel to UK I support the bager cull or fox hunts. I didn’t know that if I travel to Iceland, Japan or Norway, I support the whaling there. I didn’t know that if travel to Spain, I support the bullfighting and so on. This is BS at it’s best. Covering our eyes when an animal is killed, it should be done behind the walls so the sensitive us to feel better and superior towards the countries that do not make a secret of how animals that are eaten, are actually killed. PS. As a matter of fact, there is no periodicity, there is no “every year in July”. Wow, inside staterooms start at $7,200 and go to $10,200. That’s a lot of money. And the Concierge tab is already booked up, double wow! Would love to do something like this but would never be able to with those kind of prices. Know what you mean, just been in the Cunard site and have concluded that somebody at DCL has gone insane! All the Queens are newer than dear old Magic too. We booked on opening day, and the prices were MUCH MUCH cheaper then. Tons of people booked and prices skyrocketed. All 4 of us in a porthole room cost $7,874 (with the 10% onboard rebooking discount) . . . much better than current pricing. Faroe Islands have a bad history with Whaling, and i know that many people I’ve spoke to refused to do this cruise because of this. All you have to do is search Faroe Islands in google images and the first image will illustrate exactly what I mean! Unfortunately you state the same silly stereotypes as people who have no clue about these islands. And by the way, it is the settings of the searching engine who push up the wrong images when you look for something. Intelligent people are capable to skim through and NOT to judge a place or a nation according to one aspect. Everyone is guilty but not the people of the Färöer Islands. Accept that the civilised world will never accept your sadistic behaviour.And, by the way, tell us some new arguments, because yours we heard thousend of times in the last weeks. To anyone complaining about this cruise not going to the Faroe Islands, do you really believe kids and their families who are on a Disney cruise want to see that bloodbath? Whether you agree with the practice or not, it’s ridiculous to think that sight would be appropriate for a family vacation. Disney made a smart move. Out of curiosity, how often do you believe something like that happens in Torshavn, where these cruise liners usually stop? It is not only Disney who blows it out of any proportion, it is also people like you who like to exaggerate and make it more than it actually is. PS. You do realise that they could also witness how whales are killed in Norway or Iceland also, don’t you?! Or you are not even aware those countries do that too?